PRODUCT: 3/4 in. 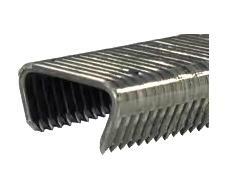 D-Style Hog Ring Staple, Collated 15 Gauge Galvanized Steel, Sharp Point. 50/Strip. 10,000/Box. Price/Box. 22 mm (3/4") crown x 12mm before crimping. Fits all standard 3/4 D-Ring Staplers, TR203 etc. 100 Boxes / Pallet. Skid Weight About 1737 Lbs.